Good times at the A.C. Lounge! 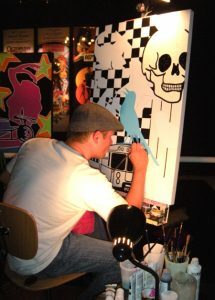 I had a super cool time painting “LIVE” at the A.C. Lounge last night in North Park. Hung out with Johnny Tran and friends and look forward to painting there more often on Sunday nights with The Uptown Social Club. I kicked off a new series at the spot and will be finishing the piece in the next few days.The A.C. Lounge is a funky little spot, felt like I was just chillin’ out in my last Studio space in Charlottesville, Va. Gotta find a new studio here in San Diego!! See you on a Sunday night soon!